The Indian Tablet Manufacturer, ZYNC GLOBAL PRIVATE LIMITED launches its first 2G Tablet, the ZYNC Z99 at a price of Rs.6,990 which has proved to be the cheapest tablet in the same category. Along with 2G calling and internet connectivity, the tablet offers 3G connectivity though only through data cards. The tablet sports a 7 inch TFT LCD Capacitive Touch Screen which has a 5 point multi touch with a screen resolution of 800 x 480 Pixels. It is powered by a 1.2 GHz processor bundled up with 512MB RAM and a Lithium-Ion 3000 mAh battery life. It features the Android 4.0 Ice Cream Sandwich OS. The tablet is equipped with dual cameras of 0.3 MP along with a voice calling facility. The tablet has a 4GB internal memory which is expandable to 32GB. Users can connect through the GSM SIM slot, as well as a Micro USB port. The tablet can also be accessed through Wi-fi connectivity. Z99, like several other products from the company, also has the BigFlix application embedded in the tablet, which gives a seamless movie experience to film buffs. And to give unparalleled experience the company will be giving 1 month's subscription of the service free to customers. The 2G tablet would be available across all e-commerce websites like, Naaptol.com, Homeshop18.com, Flipkart.com, Themobilestore.com, Tradus.com, Infibeam.com,Shopping.indiatimes.com, seventymm.com, Snapdeal.com, Indiaplaza.com, Yebhi.com, Shopclues.com, Bagittoday.com, Starcj.com. Zync offers a one year pick up and drop facility in case the tablet stops functioning. 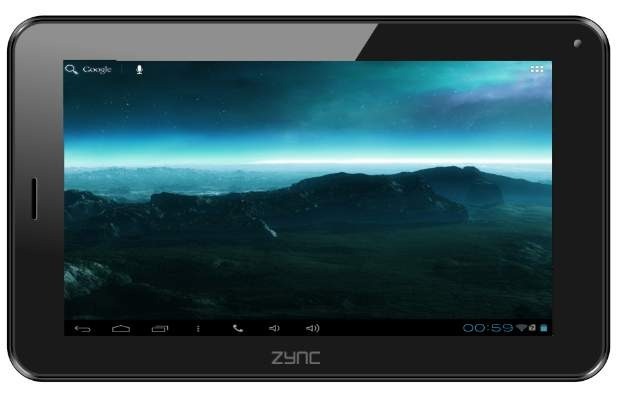 0 Respones to "ZYNC UP With its First 2G TABLET Z99, Costs Rs.6,990"